During Pittsburgh Restaurant Week, Avenue B offered an unpublished lunch special of a “Main Dish” plus a “Beginning” or “Dessert” for $20.14. Because many items on Avenue B’s lunch menu aren’t pricy, you could feasibly be under $20 without the special. So in all honesty the $20.14 combination is subject to what you choose. Today for lunch I chose to sit by the window which provided for great lighting for photographs. My dining partner couldn’t resist ordering the Pork shoulder poutine as a beginning. She twisted my arm asking that I partake. So as a good friend, I obliged. The pork was so tender and juicy as a result of the braising process. Like many of the other items on the menu, this is served with sweet potato fries which appear to have a light dusting of sea salt for seasoning. The onion straws were better to eat with your hands as they didn’t wrangle easily with a fork. If we knew the portion size, I may have likely ordered a smaller entree for lunch. Definitely a steal for only $10. 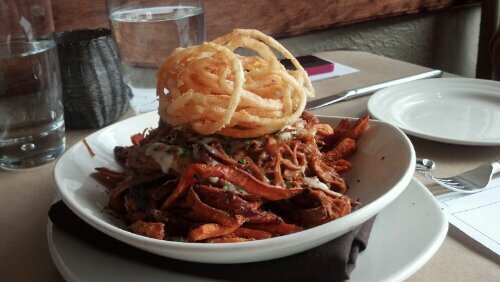 Pork shoulder poutine, BBQ Demi, cheddar and fried onions. 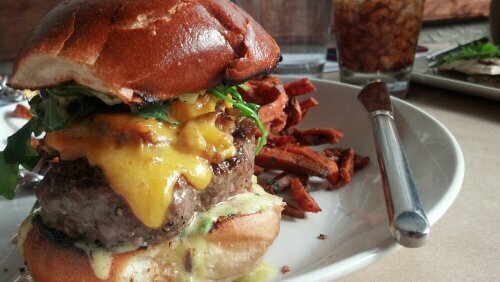 Though the poutine had my stomach beyond 50% capacity, the burger arrived looking stellar. You can see from the pictures that plating is a strength of Avenue B. Ordered medium, the burger arrived cooked well and still hot. The juices poured from the burger with each bite. Luckily the bun was soft because I needed to pinch the sandwich together to fit it in my mouth. After having sweet potato fries with the poutine, I opted to pick lightly at them and save room for dessert. A whole-hearted fan of blondie brownies, I enjoyed the deconstruction / reconstruction of the blondie elements into this sweet dessert. Officially listed as a torte, the item was basically two squares of a caramel-chocolate-shortbread cookie with salted pretzel ice cream between served atop some crisped apples covered in a lighter caramel sauce. Don’t you want to just eat the picture? I didn’t leave a trace on the plate and immediately needed some water to wash it all down. Ideally, this would replace my afternoon coffee if the sugars carry me through the day. 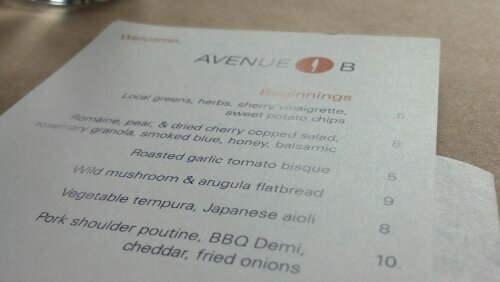 In the end, a very positive experience at Avenue B. My dining companion shared an adversion to goat cheese and her flatbread was served with goat cheese, even though it wasn’t listed in the description. The waitress gladly removed the item from the bill and offered to correct it. Luckily the poutine was filling and our minds were tuned toward dessert, so she opted not to get another dish. The flatbread was visually delicious, though I can’t speak to its taste. The service was great, the food was great and the company was great. 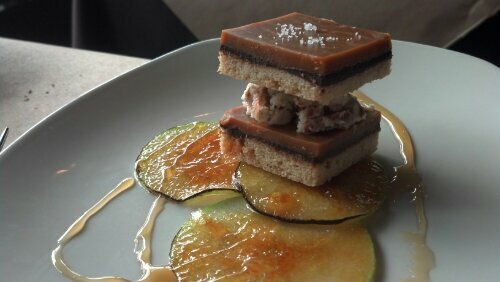 Great new restaurant experiences is what Pittsburgh Restaurant Week is all about.